While going through the download motion like many of you when vSphere 6.0 was generally available, something that caught my eye in the vCenter Server download area was something called the vCenter Host Gateway (vCHG) virtual appliance. At first, I did not know what that was and until I spoke to a few colleagues did I realize that vCHG is the evolution of the Multi-Hypervisor Management (MHM) Plugin which provides vSphere Administrators a way to natively manage Hyper-V hosts within the vCenter Server UI. MHM was originally released as a Fling and later then productized within the vCenter Server product. At the time, it made sense for the plugin to be Windows based as it needed to connect to Hyper-V which obviously ran on Microsoft Windows. It looks like the folks over in the MHM team have been quite busy as they have gotten rid of the Windows installer and have now provided a Virtual Appliance which uses winrm to directly communicate to the Hyper-V hosts. In addition, you can now manage Hyper-V hosts within the vSphere Web Client where as previously it was only available using the vSphere C# Client. vCHG works with both vCenter Server for Windows as well as the vCenter Server Appliance, there are no additional Windows host required for this new solution. Deploying and configuring vCHG is relatively straight forward and you can find all the instructions here. There were a few minor gotchas that I ran into and I thought it would be worth sharing, especially figuring out what was needed on the Hyper-V hosts which was mainly due to my lack of familiarity with winrm. At this point, you can now login to your vSphere Web Client and to add a Hyper-V host, you will need to add at the vSphere Datacenter level. This was another thing that I missed and though could be added into its own vSphere Cluster. As you can see from the screenshot below, we have extended our "Add Host" workflow to natively support Hyper-V hosts, so that it is intuitive and familiar for our vSphere Administrators. 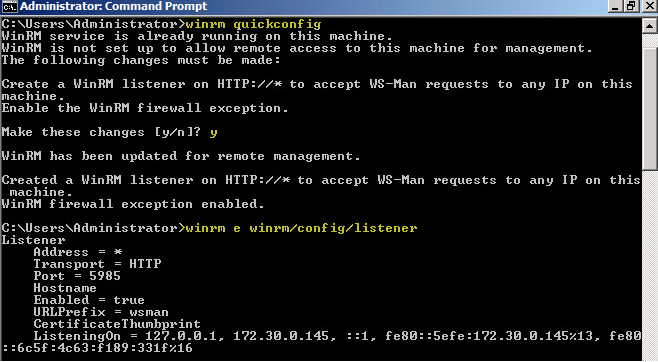 You will need to specify both the Hostname/IP Address of Hyper-V host followed by the winrm port (e.g. hostname:5985) and then select the Type to be "Hyper-V" and in a just a few seconds, you will be able to see your Hyper-V hosts within vCenter Server and perform basic power operations as well as creating/managing VMs running on Hyper-V. Below is a screenshot of my Hyper-V host and I just finished created a new VM using the vSphere Web Client and you can see it seamless integrated into a single view. This is great enhancement for customers who have to run a mix workload between vSphere and Hyper-V (I do apologize to those in advance ;)) but at least you now truly now have a single integrated pane of glass to manage all your workloads. I also do want to stress the word "integrated" beyond just the UI component that vCHG provides. I have found that all the operations through the vSphere Web Client is also exposed through our rich vSphere API, for example the AddHost_Task() method now includes a new hostGateway spec. This also means you will be able to use all the existing power operations and create VMs methods against your Hyper-V hosts, again tightly integrated into the existing tools you are familiar with such as PowerCLI for example for Automation. How freaking cool is that!? While going through the exercise of deploying vCHG and adding Hyper-V host, I could not help but wonder why we named this feature "Host Gateway", especially since we only supported a single third party hypervisor, did not really make sense to me? Well, it turns out there is a lot more coming! When you select the "Type" from the drop down menu, I notice there were a few more options: KVM and vCloud Air! I of course I tried to add a KVM host as well as my vCloud Air account but looks like those providers are not available just yet. I am actually quite excited to see support for vCloud Air. This has always been something I felt should have been available natively within the vSphere Inventory so that an administrator could deploy their workloads either locally on-premises or hosted on vCloud Air without having to jump around. It should align with the existing vSphere Administrator workflows and I am glad to see this change. This is definitely an area that I recommend keeping an eye out on and hopefully we will see vCloud Air support soon! VMware has the best platform to run latest Windows 10 Desktop, Server & Hyper-V Tech Preview! Yeah, unfortunately, KVM does not work. What’s about XEN? Any plans to add it? In theory, if VMware is using the libvirt API ( http://libvirt.org/ ) then KVM, XEN, and others should be supported at least a little. Not all operations will be supported but the basics should be available. If we create a Hyper-V cluster in our vCenter, the DRS, HA are features avaible. AnyWay thanks for your sharing ! So, it is only possible to add the Host to the Datacenter object (not to a cluster). HA and DRS implement VMware code as agents, processes, and data, stored within the ESXi host – and therefore these features will only be available when using ESXi hosts, registered to in a vSphere cluster (ClusterComputeResource) in vCenter. In fact i missed that part, then every thing is going more clear. Then you can use them only as Standalone Hypervisor. Nice Post and looking forward to the next update. Does a console session to hyper-V VM work with this? Is there a way to launch a RDP session from either Classic or Web clients? any idea what is required for licensing for this? I see it requires to assign a license to it.